Something about that simple design really does make those photos spectacular, is it the broad sweep of the wheel against the calm background? Simple is hard for me. I love the look very much, but, although I fight it, when I make a very simple page it still leaves me feeling a little creatively "unsatisfied". maybe I just need more practice! What a great layout! It's funny . . . 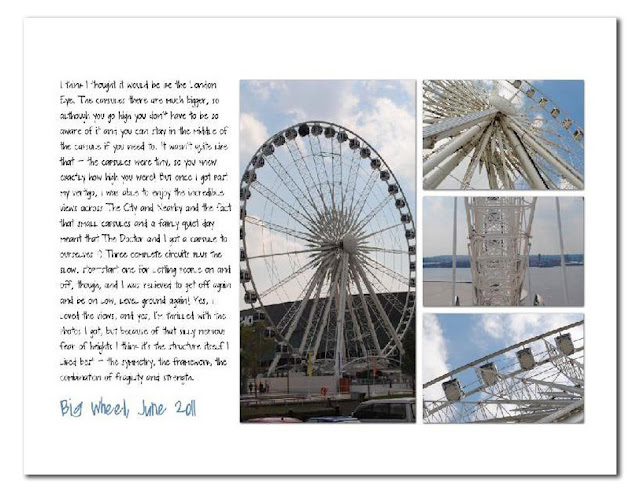 I almost put ferris wheel on the summer scavenger hunt. Love all the details of the Eye that got in those photos,Mel....and a great layout highlighting them. Though my feelings about simple tend to reflect Sian's. I think a simple style is perfect for your photos. Lots of embellishing would overwhelm them. Thanks for the link! Great LO mel..I've obviously missed this new venture of Amy's while I was away-will go check it out! Thanks for the link Mel...another great blog to visit!! I'll try & play along with their first challenge too, but you can bet my LO won't be anywhere near as simple & uncluttered as any on the blog!!! I LOVE what you did with it...the clean & simple lines are the perfect showcase for those stunning photo's...just sorry I can't make out the journalling!! But I bet that tells a wonderful story too!! You got some lovely angles in those shots. Aha, I recognise that wheel, although I've yet to go on it. Lost count how many times I've been on the London Eye, though. Youe page looks really great ~ a simple design enhanced by superb photos. Thanks so much Mel for all of your very kind and supportive words here today! I think a lot of people believe simple is plain - nothing could be further from the truth, simple scrappers still love papers and some embellishments ... I think the essence is not forgetting the journaling! Great layout. The photos look great and love the white background (my go to colour!). Thanks for joining in! I'm with Amy..the essence of why I love simple is the story AND these stunning photos take the centre stage! I often try to use a colour other than white for my background but always end up pulling the white out. I love to take bright photos and they just seem to pop more on a crisp white background. Mind you I love nothing more than to get "crafty" and find that I save that for creating cute fun mini albums. Thanks for joining in. I love the simplicity of your layout! Cool photos too. Your photographs are marvelous and really take center stage on this layout! I love it!! Great Lo. I love all the different angles of the big wheel. This is glorious - such lovely photos, and I really like the way you plunged straight into the journalling.